The influence space of Venetian mirrors black. Black Venetian mirror can double the sense of space. If the area of your home is limited, do not be discouraged! Nowadays a lot of ways to make room occupancy arrangement feels more narrow width. 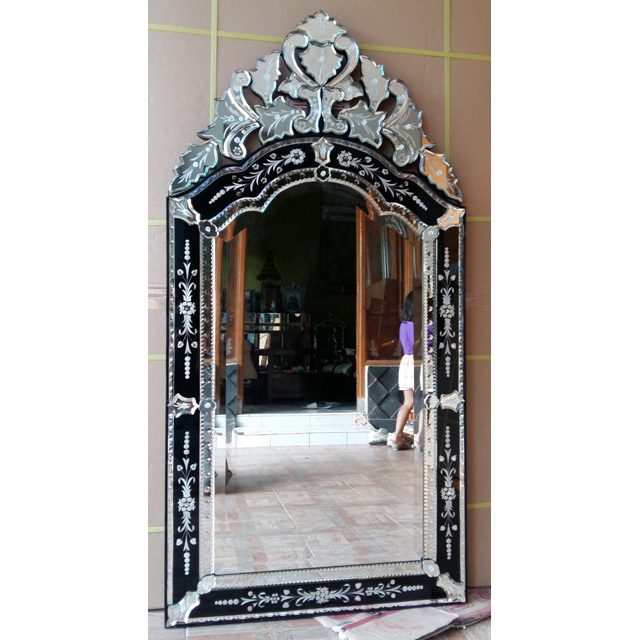 one of them by presenting black Venetian mirrors in your home. So powerful influence on space mirror. vista has been shown to double the space. Because the mirror can give the appearance of objects or wall in front of him so that the reflected vista be great. Another uniqueness of the mirror with black color is: giving a neutral color and harmony if in a hanging wall. Frame shape that surrounds the center with a beautifully carved glass adds style mirrors this perfection. Why should choose black mirrors? Because black has no color fanatic for people who have it. This color has become will never fade evidence of any developmental years; time to time remain in love. do not be surprised if a lot of the behavior of interior designers chose this color as a complementary wall decoration. In addition, it is suitable for mirror black design mirrors oval or Venetian mirror rectangular design. With additional crown at the top adds elegance. Please look at us to see the different designs of black color. Indeed we admit that this color in Venetian mirrors lacking in interest. Because the supplier has not been made at that time and also the type of black glass is hard to get. With the changing times after the glass can be purchased almost the entire city then the border of Glass manufacture especially trying to make and the result was a lot of interest by the market in Europe, America, and Asia. Black Venetian mirrors black in addition to double space can also manipulate the sense of space. This means that the mirror is one of the advantages is its reflector. And also can provide a shadow reflection by a mirror so that the room looks so much larger.